Yup. The entire family just ditched my husband’s employer provided health insurance* and as of January 1, 2014 we’ll be on a plan with a different insurance company. One that, unlike Aetna, decided to go after our business and compete in the marketplace. 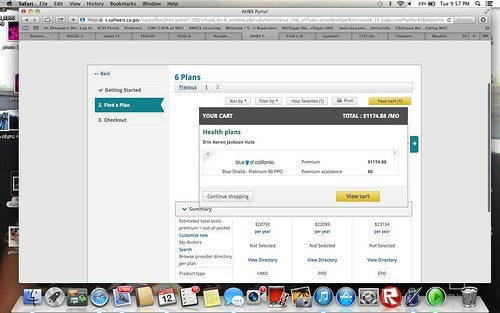 Our old plan had deductibles, and the out-of-pocket costs were 6k for individuals and 12k per family. This new plan from Blue Shield of California? No deductibles. Lower out-of-pocket maximums. Lower copays. Lower drug costs. All of our doctors are in-network minus one. But that’s why I got the PPO. It’s also a 90/10 which means we pay 10% of things normally not totally covered like hospital stays and MRIs and what not. Our old plan? 80/20 in network and 60/40 out of network. Keeping in mind just about EVERYTHING for me was out of network. After doing all the math, just to start, we’ll be saving $18,900 per year. That is without knowing if I will be hospitalized in 2014, or need surgery or any of those things. In 2013 I was hospitalized once in July and the bill is still sitting on my desk. I’ve been making payments. If the judge from my Social Security Disability case rules in my favor, that means I’ll be eligible for Medicare as well. IF that happens, that will mean we may not have much out of pocket at all. This makes me shake and cry. We are one of those families who have been buried in medical debt since I got sick. We’re one of those families the President talks about…the ones who are so close to losing everything because Mom got sick. We’ve re-financed our mortgage using the HARP/HAMP plans with JP Morgan Chase. It wasn’t easy or pretty, but we managed to save some money per month to keep our home. Now we are utilizing Obamacare. And yeah, go ahead and call it Obamacare, because without the President we wouldn’t have this opportunity. I realize many of you are getting hit with higher premiums, but understand they have been higher EVERY YEAR FOR YEARS. This is WHY we all wanted health care reform in the first place. Premiums were going up and up, deductibles were going up, care was a pain to get at best and you had to fight your health insurance company for every drug your doctor prescribed and for every test they wanted done. Please understand this is why we went down this path and supported President Obama at every turn. Because the industry needed change, but more importantly Americans deserved better. No one should be as afraid and stressed as we are/were while battling an illness. In the greatest country on earth people lose their homes, they lose their jobs, they lose their insurance because the company tries REALLY HARD to kick you off the policy…they lose their MINDS because they are sick. All they should be doing is healing and getting bettering and following doctor’s orders. I know this first hand. I have lived nothing but THIS for nearly three years. In my case, the stress was so great I tried to go back to work several times. It made me sicker. Had I not tried, I might not be as sick. I might not have as many problems. I might have a home that isn’t adjusting to a new normal but simply going about life as usual. I came up with a plan. It had to include disability that was solid. So I used my employer given benefits and I fought Mutual of Omaha at every turn. After 9 months of denials and questioning and all out war, I received long term disability. Part of my policy states I MUST apply for SSDi and I MUST appeal any denials and use their lawyers. It’s fine though. I now get a check. It essentially pays our mortgage. If I do get SSDi, my income won’t change, but SSDi will pay part of that check and Mutual of Omaha long term disability will pick up the rest. It’s being eligible for Medicare that will really change the game. Never mind that Mutual of Omaha still puts me through tests. They currently are seeking another rheumatologist for another (it would be my fifth) opinion. At least that’s what their letters tell me. However my guess is they are having trouble finding someone I haven’t already seen within a 100 mile radius. My plan also had to include affordable health care. That meant joining the chorus of supporters for the Affordable Care Act and whenever I was physically able I had to make sure it passed. Then, once it passed, it had to stay law. Something the Right is still trying to overturn. So I continue to fight, even while hooked to an IV. Now we have Obamacare. My family is enrolled. Typing that is almost surreal. We are enrolled in Obamacare. Instead of Aetna we will have Blue Shield of California. I feel like my armor has been fortified a bit. I’ve been fighting this battle for nearly three years now, and for the first time I feel like we have a real chance to keep our financial lives in order, and I can take away a little stress from this house. For someone who has been nothing but sick, nothing but helpless, nothing but reliant on others…this is huge. Yes, there are tears streaming down my face as I type this to you. I’m not sure if you can comprehend what true illness and financial stress does to a family. Constant stress is no way to get healthy. All I want is to be healthy. I’m trying so hard. I am doing everything I’m supposed to do and have done everything I was asked by every doctor. I just want to get better and return to LIFE. I know that is not the case with every American. Not only do they not understand, but they don’t care. It’s MY problem, not theirs and they feel no need to help in anyway, shape, or form and that certainly means Obamacare. I’ve been told this is ‘natural selection’ or ‘survival of the fittest’ and too bad for me. I’ve been told we should have planned better. We should have saved more. We should ask family for money. Let me be clear- you can plan and save all you want, but when you are chronically ill or in a serious accident or get an unexpected illness, ONE hospital stay can set you back more than your home costs. You can’t plan for that in regular America. We have insurance, we had savings, we have family support and we are still hanging on by a thread. And then there are those who wanted to keep the health plan they had, but their insurance company didn’t play by the rules. They are finding their state isn’t participating in ACA and denying it’s citizens the funds for Medicare. Or their state isn’t participating so there isn’t’ much to choose from in their exchanges. To those Americans I would urge you to fight like I did. Fight like hell to make sure your state and your politicians LISTEN and do what is BEST FOR YOUR FAMILY. Make them take the Medicare money and make them participate! You have the power. You have a voice and it’s louder than you think. Look at me. What did I do? I told my story to anyone and everyone that would listen and argued with anyone and everything I found dead wrong. My family and I told our story to the White House. So can you. We are now enrolled. We are getting $0 in subsidies. But we are saving at least $18,900 per year. For a family that is swimming in medical debt, with no end in sight, we can now see light at the end of the tunnel. See if you have some light too. Go to HealthCare.gov and either create an account or call the number. If you don’t trust the government, let an insurance broker do it for you. I don’t care HOW you do it, just do it. I look forward to paying our first premium. It will be the same as what we paid out of my husband’s check anyway. However we will now get so much more. 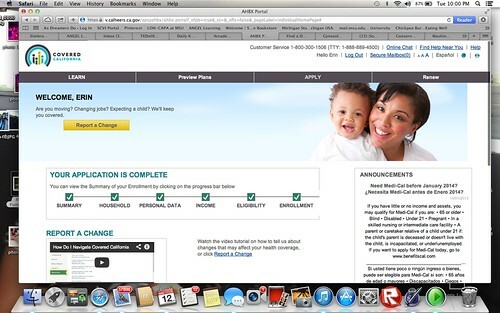 *Update 12:07pm November 13, 2013 I’ve added a flickr photo set of the Aetna plan we had the opportunity to ‘re-enroll in’ from my husband’s employer. SO happy that it worked out well for you!!! This is what we fought for. This is what health care reform is all about. I am so happy for you! Thank you for explaining this so well and so thoroughly. I’m going to share this with our kids who are in their 20’s and need to understand what they could potentially be facing post college. They especially need to sign up now and others in their generation so we can all begin to benefit from a health system that is finally rooted in some sanity. Thank you, thank you for sharing your story so more people can understand and get on board. I really am so happy for you, that’s just fantastic news. I just can’t wrap my head around having to come up with almost $20k a year on top of insurance premiums just for healthcare, something that everyone should be entitled to. I really don’t know how I’d cope or manage in the same situation but it’s great that at least some of that burden and stress has been lifted for you and your family. This makes me very happy. And wondering if it’s possible to ditch my husband’s employer-provided healthcare and find something better, too. I’m thrilled for you and your family! Thank you for sharing your important and moving story. Thanks for sharing the details, Erin. There is so much misinformation out there right now; this helps. Mary I’m not sure where you are confused. We have a re-enrollment period each year for my husband’s insurance. This year we received the information and looked it over, and then I shopped the exchange to compare. We found a much better plan on the exchange. So we declined my husband’s employer health coverage (we kept his dental and vision) and enrolled in the Obamacare exchange. No, we did not receive subsidies and the plan we were being offered did change from last year to this year. In fact, it’s changed nearly every year. The premium stayed the same (or very close to it) but everything else went up. As far as I know the plan did meet all standards, however we were given the option to decline or accept coverage. We declined and enrolled in the exchanged offered plan instead. Mary just to be clear- you can decline your employers coverage and enter the exchange regardless of if you qualify for tax credits or anything else. Your employer coverage may be better, or worse, or not- but you can still shop the exchange no matter what, you just may not save money. In our case, we found a plan that saved us money. For instance, our premium will now be after taxes, not before. We won’t get an employer contribution…but I’m not sure we were getting one before. All savings we’d be eligible for depends on household income. The House GOP is asking people to post bad stories about Obamacare on its website. I say we should post all of our GOOD STORIES about it on their website….flood it. A good social hack is called for here. So go to http://www.gop.gov/yourstory/ and tell those lying GOP Reps that people are LOVING what they are getting from Obamacare. What an incredible story of hope!! Dear Queen, may I repost this on the ACA “Obamacare” Success Stories Facebook page? Pamela, of course you can. Spread this far and wide. People need to see it works when done right- when your state cooperates and your Governor cooperates and when things are done RIGHT IT WORKS. That’s fantastic! I’m still enrolled under my insurance, but thank goodness for my husband’s pretty amazing insurance because otherwise we would be paying CRAZY amounts of money per month to cover all five of us. So it’s good to hear that it worked out for you. Let us know how it goes down the line! Mary, My experience was nearly the same, except after 3 open heart surgeries in less than a year, while insured by Aetna through my employer, I am in the middle of a personal bankruptcy. Since I can’t work any longer (a year and a half ago, I considered myself very healthy) I am currently on Aetna COBRA 80% plan with $1500 deduct & $3000 annual max OoP for $550/month. 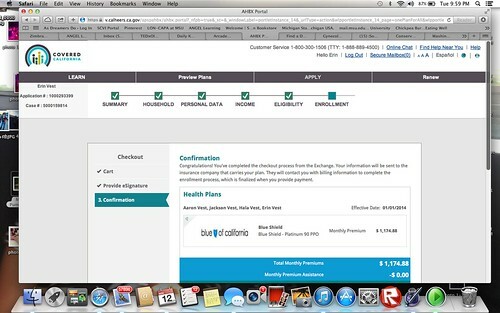 I got a Blue Cross of FLA 90% plan on the exchange with a ZERO deduct & $2000 max OoP. It also has half the co-pays. My new premium is less than 1/2 of my old one, including my ObamaCare tax credit. I’m PROUD to say ObamaCare because I really do believe the Obama CARES! I thank G-d for him every day! Thanks for posting! I had a similar experience, although no one in my family has preexisting problems worthy of note. My family is saving $6000 next year (provided no increases to my wife’s plan – none received to date – and, no, we do not qualify for any premium discounts). My wife is keeping her own employer plan with my son. I have registered, and we are happy to free up a nice chunk of change next year. Would like to know how you were able to not have a deductible if you didnt qualify for subsidies. If more of us, were well enough to make noise and drown out the naysayers, this situation would be much better. Massachusetts had none of this noise from the opposition, but experienced many of the sign up problems. We can’t count on our Democratic representatives. They are too worried about the 2014 election to stand for anything. They can’t even figure out how the insurance companies just engineered all this chaos after the slow roll out. Too bad for this country turning their backs on the sick and the infirm… no good can come of this. Roger- deductibles don’t have anything to do with subsidies. You’re welcome to go look at the Blue Shield of California Platinum PPO 90 plan that we enrolled in… it has zero deductibles. That’s the plan they offered. Why would you think subsidies and deductibles are connected??? I support ACA, because no matter the problems people who are desperately ill, and have a preexisting condition, can now purchase insurance.. Instead of the Democrats caving this last week, they could have used this last situation to demonstrate to the American public, how the insurance companies can capriciously drop its members ad lib. Why is it when I go on to the exchange I can’t find a “no deductible” plan? I am playing the premium and everything for my healthcare required high deductibles, co pays and co insurances and everything given away to welfare recipients is FREE? I don’t smoke; have no preexisting conditions why don’t I have the same experience? IT’S BECAUSE YOU ARE LYING AND SPEWING OBAMA PROPAGANDA. Tess perhaps it’s because you live in a different state? Or you qualify for something else than what my family qualifies for? Also- they don’t ask if you smoke or anything like that. So I’m rather suspicious of your own ‘look’ into what you qualify for. As I have backed up what we qualified for with links and the name of the plan for all to see- I would expect you back your clams up as well. Paying over 14000 for premiums annually pretty much explains the no-deductible policy. If you pay all of the deductible over the course of the year regardless of using any of the coverage, then yeah, you don’t need a deductible. For contrast, I have a daughter with an orthopedic impairment that requires her to wear very expensive leg braces. She’s also due for surgery next month. She will ‘consume’ over $20,000 in health care this year. My insurance, through my employer, has a $1500/yr deductible and $3000/yr out-of-pocket maximum, for which I pay $75/mo ($900/yr)*. The math works out like this: $20,000+ in health costs will cost us $5400 in premiums, co-pays, and co-insurance. Compare this with the picture posted above of over $20,000 in premiums and out-of-pocket costs. There is no way we could afford such “affordable” health care under ObamaCare. I can’t figure out how anyone can consider over $20,000 in annual health care costs “affordable”. Another problem with this equation is that $900 of my costs are pre-tax and everything over 7% of my income paid toward health care above (excluding the $900 premium) is deductible from my taxable income, and therefore pre-tax. In contrast, the entire $14,000+ premium that the blogger pays is non-deductible from their income and doesn’t go toward the 7% for deductions. For full disclosure my employer pays $440/mo for my coverage and this is a family plan. Bravo! Good for you–Queen of Spain! The ACA or Obamacare has saved my family over $30,000. by letting our son stay on our insurance after he graduated college. As I am looking into policies for 2014 for my spouse and I, I have found a better policy (80/20) with the same deductible, but $2,000. less out of pocket costs, and less costs for medications. AND, we get to keep our doctors and go to the local hospital instead of one 50 miles away. It will cost half of what we pay for premiums now. AND they can’t deny us for any pre-existing conditions. For every negative story, there are thousands of positive one (ask any parent who has a child with pre-existing condition), BUT the media prefers to keep everyone fighting and angry as bad news sells better than good news or the truth. I will start with a little history hoping that those that want to have a fit about subsidies, will look at the whole picture. We owned our own successful small business for over 20 yrs. We were forced to close it in 2007 due to the downturn in construction. We have always paid our bills and made sure all obligations were paid when we closed our company. We have never asked for or received a $ of support from any where but our own hard work. We have always been makers, not takers. My husband is currently working full time @ age 63 for the same amount he made in 1972 as a union sheet metal worker. I just wanted to add our ObamaCare story. I am no longer able to work & my husbands employer does not offer any benefits. We are in our early 60’s, my pre-existing conditions and the high cost kept us from being able to obtain private health insurance. I was able to go on the exchange and purchase a policy that we could afford for 266.71 a month (with a subsidy). I chose a Bronze Blue Care policy. We will be responsible for the 1st $3500. out of pocket, then the ins. pays 70% up to a maximum OOP of $6250. As a Breast Cancer survivor I will have my annual mammogram covered. We can handle paying for our Dr. Visits but we were always afraid of a hospitalization bankrupting us. I could never put into words how thankful we are that we were able to get covered. Thanks for sharing your story, Erin. I’m so happy about the way this has worked out for you. I’ve found a policy on Covered California that’s much better than the Aetna one I currently have and will cost me $76 less a month. I definitely support Obamacare. Absolutely amazing post! I am so happy to hear this and to be able to share in you and your family’s joy. The burden that the ACA takes off of so many families is absolutely unbeatable. We will be signing up soon too! !